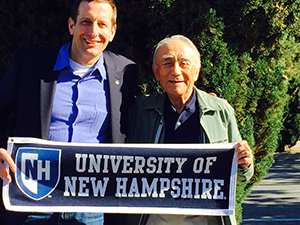 Phurpa (Phil) Ladenla ’59 shares his experience as an international student at UNH over 50 years ago and his motivations for establishing the Bertram Husch International Scholarship Fund, which supports several UNH international students each year. I was born and grew up in northeast India, in the foothills of the Himalayas. I trace my culture and lineage to Tibetan stock, which you find among descendants of people who have crossed the Himalayas from the Tibetan plateau for generations. With India gaining independence from England after WWII, and the ascendancy of America all over the world, we were all curious and wanted to study in the U.S. rather than in England, which had been the goal in the past. At the time, job opportunities back home were severely limited; and running a small hotel or working in a tea plantation was not what I aspired to. By contrast, here in America, one could find a job more in line with one’s training and education. I first learned of UNH from a mountaineer who had been climbing in the Himalayas. He thought it would be the right place for me and that I would feel at home at UNH while away from my home and family. And when I arrived on campus in 1956, I was blown away by the neat, clean and well-laid-out campus in a rural setting. Of course, shortly thereafter, Mother Nature put on her greatest charm with the New England fall color show, which to this day, evokes in me the deepest nostalgia. Then came winter with shortened days and intense cold more than I had ever experienced. But it was exhilarating, especially when everything was under a pristinely white blanket of snow. Spring delivered us from the cold plus slush and grime, and with each passing day, it was like a new gift of life. It was a revelation to step into a town like Durham where the major activity was solely education. The majority of the population was students, ranging in age from traditional students in their late teens, to Korean War veterans on the GI Bill. The former brought with them a wide-eyed curiosity and the latter a maturity of experience without a know-it-all attitude. And there were also a handful of other international students; it was very refreshing to see students from foreign lands that I had never encountered before. Though there were less than 20 foreign students, we were all invited to join the International Students Association, with membership open to the whole student body. This provided a forum for all students to learn of different cultures. We staged talks and food festivals, with cuisine typical of India, Tibet, Jordan, Korea, Nigeria, Sri Lanka, Norway, Sweden, Hungary, Turkey, Syria, Canada and Greece. We were also invited to talk before church groups and Rotary Clubs, and it was due to a Rotary Club meeting that a UNH alumnus welcomed me into his family and made me feel like one of their own for many years. On another occasion, I was hitching a ride at the Portsmouth Circle, when another UNH alumnus gave me a ride, and on the way back to campus he took me by his home to meet his family. It turned out that his wife was in my same year at UNH! They learned that I was looking for a summer job, and invited me to stay with them and their kids for the summer, and I ended up helping him in the early stages of starting his own company. I felt like one of the family, and this relationship continues to this day, though, sadly, he passed away 2 years ago. 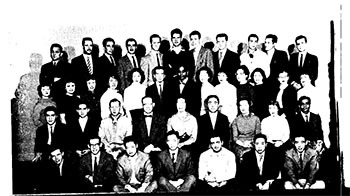 The Outing Club was very active in the 1950s, as I understand it is today. I learned to camp outdoors, downhill and cross-country ski, and rock climb. It was a thrill to drive to the base of a mountain and trudge up its slopes – something we would yearn to do in the Himalayas but their remoteness required an expedition to achieve. It was great fun to engage in a spirited game of tennis at any of the numerous courts near the dormitories, both men’s and women’s. Yes, they were separate in those days. And I quickly learned that American football was “football”, while that term used elsewhere would be “soccer” here. On an occasional sunny afternoon, we would saunter over to the dairy for delicious ice cream, made from UNH cow’s milk and rich with butterfat! I remember the young ladies at Alpha Chi sorority inviting us foreign students for a “sugaring off” party in the depth of winter: a never-to-be-forgotten treat of maple syrup poured on snow! At that time, the Foreign Student Adviser was drawn from the faculty or staff. We were very fortunate to have Dr. Bertram Husch of the Forestry Department filling this role. Many were the times when we would be invited to his home to break bread with the family and to celebrate major holidays as Thanksgiving or Christmas. I also remember when campus would be shut down between semesters, and foreign students at that time had to find lodging elsewhere in town. But we were always welcome at the Husch home for a meal or to stop by if there was anything we might need. Dr. Husch was both perceptive and compassionate, and several times I would find a note in campus mail notifying me of a grant to help with tuition expenses. This was always a great help since the exchange rate for remittances from home was adverse, and it augmented my earnings as a dorm counsellor (East West Hall) and part-time data processor in a physics project financed by NASA. I carried these happy memories with me into the working world, starting in engineering, then moving into sales and marketing, followed by earning an MBA and subsequently joining a laser startup in Silicon Valley. I remained in the photonics industry until my retirement in 2008. When, blessed by sage advice throughout my career, I was successful enough to give back, I thought of my alma mater and providing scholarships to international students so they can get an excellent education, and the care and attention they need to succeed, at UNH. Naturally, when it came time to give the scholarship a name, I thought of Dr. Husch, of whose legacy I consider myself a part. And my wife Sophie wholeheartedly concurred in this decision. Every year, I am impressed by the caliber of the young people who have been awarded the Bertram Husch International Scholarship. Their stamina, dedication and brightness promise a great future. But I also want to congratulate the Scholarship Committee for their perceptiveness in their selection and UNH for prioritizing the internationalization of its student body and globalizing the education it provides its students, through curriculum, study abroad opportunities, and exciting international programming on campus. I am proud to be an alum of UNH, and to give back to my alma mater—an institution that recognizes that the world is truly small and interconnected.